That wide-ranging musical approach means that the 80th Anniversary season includes performances by classical pianist Jean-Yves Thibaudet (June 24), Amy Grant (June 25) and Béla Fleck (June 28), as well as major symphonic concerts. 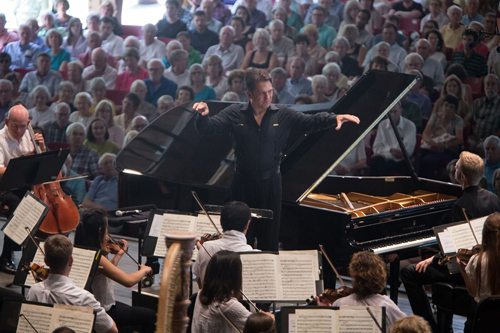 The opening weekend’s events also prominently featured Keith Lockhart, BMC’s Artistic Director, the principal conductor of the Boston Pops and an alumnus of Brevard Music Center. The BMC 2016 season offers everything from full-orchestra performances at the indoor Porter Center and the open-air Whittington-Pfohl Auditorium to several smaller, more intimate venues on the BMC campus. Vennare notes that fully 50% of the performances are free and open to the general public. And low-cost options exist for some of the pricier shows: lawn tickets at WPA shows start at $15, with free admission for kids. Some major musical talents received important training early in their careers at BMC. And for the anniversary season, the Center is bringing back some of those distinguished alumni. “We’re reaching out to our alumni – conductors, composers, musicians and singers – in a way we never have before, inviting them to come back here and celebrate the season with us,” says Vennare. Plans for the celebratory season began some time ago. One of the changes return concertgoers will note is the improved sound at the 1800-seat Whittington-Pfohl Auditorium. In addition to covering the orchestra pit, thus moving the music closer to the audience, BMC has done what Vennare calls an “acoustic enhancement.” That project – installation of mobile, modular panels to improve musicians’ ability to hear one another – is part of a larger $2 million project for improving staging, renovating the band shell, and making additional technology upgrades related to rigging and LED lighting.